Our goal was to come down to Peoria and win. We can’t wait to bring this state championship back to Chicago and share it with the Providence St. Mel community. 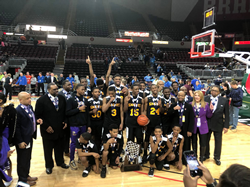 After 34 years waiting, the Providence St. Mel (PSM) Knights are 2019 Illinois High School Association (IHSA) Boys Basketball State Championships with a 52-29 win over Cissna Park this afternoon at Carver Arena in Peoria. Leading PSM in scoring was Tyriel Nelson, who stole the show with 15 points and five assists and winning WinTrust Player of the Game. Senior guard Deion Jackson had 13 points and Jason Mason had nine points. Senior guard T.J. Ervin II had six points and two assists. 2018-19 was a tremendous year for the PSM Knights and a successful season with an 18-10 regular season record for IHSA and a 6-2 regular season record in the Catholic League White. “The team has been dedicated all year, and we always believe that being consistent at a high level is the key to being successful and prosperous in the journey of life – to state and beyond,” said PSM senior guard Samuel Herenton. Talent and athleticism dominated the varsity Knights. In addition to Nelson, Herenton, Jackson, Mason and Erwin, the contributions and energy from PSM senior guards Taeyon Neal and Eric Jordan made the team shine and helped build on the foundation for the future of PSM basketball. In postseason, PSM was ranked No. 1 statewide in Class 1A and won their six playoff games by an average margin of 34 points. It’s was the team’s second appearance in a row at Super Sectionals. Before this year, PSM had been state final qualifier seven times, most recently during the 2013-14 season in Class 2A. The Knight’s win is also Chicago’s first Class 1A title since the IHSA went to a four-class system in 2008. According to four decades of tradition, PSM has only hung one winning basketball banner in the gym, which was the 1984-1985 state championship banner. A legendary team led by Lowell Hamilton and Fernando Bunch, has historic significance to the school, setting a high-standard every PSM has strived to achieve, until today. The 2018-2019 state championship banner will now be the second to hang in the school gym. To learn more about Providence St. Mel School basketball or to attend the Saturday, March 30, 10 a.m. open house, visit http://psmnow.com or follow the hashtag #PSMPROUD on social media. Providence St. Mel School is a private, coeducation school for preschool through 12th-grade students on Chicago’s West Side. Since its founding in 1978, 100 percent of PSM graduates have been accepted to four-year colleges and universities, including Ivy League schools. PSM is dedicated to excellence in teaching and learning, and to providing a high-quality urban education. Visit PSM at http://psmnow.com, Facebook or Instagram. Founded in 1900, the Illinois High School Association (IHSA) is a private, not-for-profit organization with more than 800 member high school schools in the Land of Lincoln. The IHSA’s mission is governing the equitable participation of over 400,000 high school students competing in nearly 40 sports and activities. Headquartered in Bloomington, the IHSA strives to promote academics, sportsmanship, safety, good citizenship and the lifelong values that are the foundation of interscholastic participation. Visit http://www.IHSA.org for more information or connect with the IHSA on Social Media via Facebook (/IHSA.IL), Twitter (@IHSA_IL & @IHSAState), Instagram (/IHSA_IL) and YouTube (/IHSA).The Future Plays Here!